These stacking chairs from Offices To Go™ feature commercial grade, stain resistant fabric upholstery available in your choice of gray or black. Other features include padded seat and backrest cushions, metal frame for stability, black epoxy powder coated finish on frame, stackable up to ten chairs high. 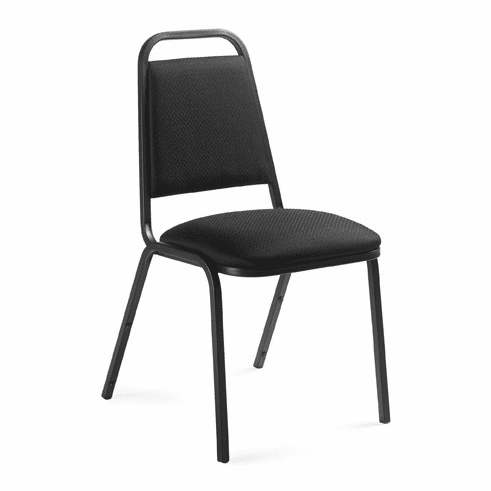 These stacking chairs meet or exceed ANSI/BIFMA standards. Due to size and combined weight these stacking chairs will ship by common carrier. Dimensions: Seat Size: 16.5"W x 16.5"D. Back Size: 12"W x 15.5"H. Seat Height: 18"H. Overall: 33.5"H x 17.5"W x 22.5"D. Five year warranty from Offices to Go. Gray, Navy and Wine fabrics normally ship in (15) business days.